This rich cream with sustaining nutrients activates the natural regeneration processes during the night. 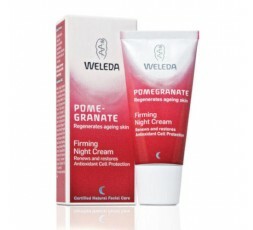 Weleda Pomegranate - A reinvigorating skincare system created for maturing skin aged 40+. Containing organic cold-pressed pomegranate seed, argan and borage oils that are rich in antioxidants and stimulate skin renewal. Depth of wrinkles 35% less after 28 days*. *measurement of depth of wrinkles with PRIMOS, test with 21 subjects in 2009, age: 42-69 years. Pomegranate Firming Night Cream gives the skin an extra boost during the night when the skin’s cell renewal and repair processes are accelerated. The skin receives intensive hydration and nourishment throughout the night, leaving it looking rested, soft and smooth in the morning.